Lisa Rinna before and after lip reduction plastic surgery. Did you hear the news? 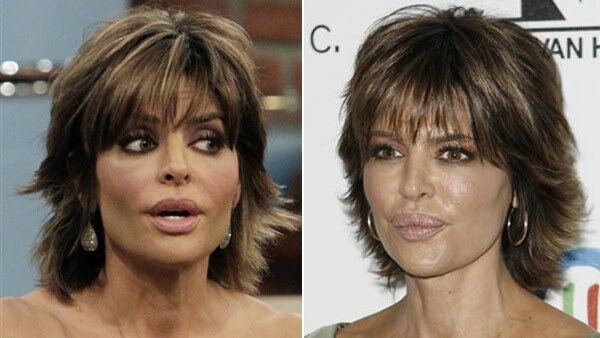 Our biggest beloved lips of the west, Lisa Rinna, has successfully downsized and re-sculpted her world famous kisser after undergoing lip reduction surgery, in august, however the results will take up to 6 months to show completely. As you may remember, Ms. Rinna had an unfortunate experience in the 1980s, when her silicone lip injection developed scar tissue, resulting in a puffy and lumpy upper lip. Lisa recently told People Magazine: "My lips started to define who I am. That bothered me... I took a big hit for being honest. It gave everyone online permission to lambaste me. It hurt my feelings". Concerning her post lip surgery: She says rather than feeling "bumpy and uneven, my lip has no lumps! It's smooth." she added "It doesn't matter what other people think, I did it for myself." And with that being said, Chapstick companies around the globe are scrambling to recover from this devastating turn of events, which is expected to set several companies back substantially during this already tough economic time. We kid because we care! Be blessed Lisa! Thanks for your informative post. I am glad here to be a part of your article… good day.